โอ้! อยากได้! อยากได้! อยากได้! อยากได้! 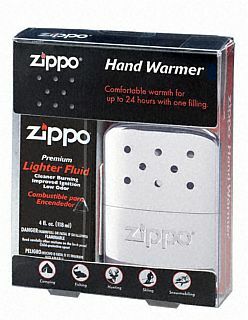 Zippo handy warmer gives the best performance- maximum 24 hours of constant warmth- at the outdoor activity in the arctic region. Zippo handy warmer is a chemical warmer which does not work directly by burning oil, but by making vaporized oil oxidized and generates heat with platinum catalysis. It causes neither air pollution nor occurrence of waste, thus contributes to the environmental protection. The instructions below has been simplified. Read the instructions on this manual carefully prior to the use. Weight zippo oil using the filling cup. Pour zippo fuel in this set slowly into the mouth of tank using the filling cup. Put the burner back and tilt the warmer body, then apply a fire to the burner element with a match or a lighter for 3 to 5 seconds. Replace the top cover and put the warmer into fleece bag. The warmer gradually becomes warm. 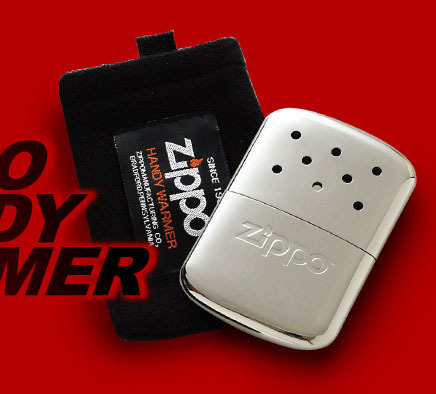 Replacement burners for zippo handy warmer is available at the stores which you bought the warmer, the zippo specialty stores, and through internet. Q.The warmer does not work long A.The temperature of the warmer and the working time is depend on the condition you use the warmer. The warmer becomes hotter in the warm place and working time becomes shorter. always keep the warmer in the fleece bag. Wrap it in with an additional piece of cloth if it is still too hot. Be careful when you are lightly dressed. Q.The warmer is not warm. A1.The warmer does not generate the heat with inferior fuel. Use zippo premium lighter fluid which is available at convenience stores, supermarket, and diy stores. A2.If the location of the inner cotton is too high and it touches the burner, the vaporization of the fuel may not occur. In the case, lower the location of the inner cotton 5mm below from the open mouth of the tank. A3.Possibly the burner has been damaged too much. A burner usually durable for 70 to 90 times use, however the damage gets worse rapidly by flaming up with the fluid stuck to the burner when lighting or applying a fire too long. Those burners become too old earlier than usual. Purchase the new burner in the case. Q.The warmer works too long. A.The temperature of the warmer and the working time is depend on the condition you use the warmer. The warmer becomes less warm and works longer in the cold or less oxygen place. Use more or less fuel depend on the environment. Q.The tank become overflowing when filling. A.Pay attention to the cotton in the tank and fill the fuel slowly. If there is leftover oil from the last time in the tank, You can not fill the maximum amount. Do not try to fill too much oil. Try to discharge the excess fuel. Q.How to stop the warmer in the middle of the use? A.You can not stop the warmer from generating heat like disposable body warmer. If you want to stop using it, leave it in a safe place and let it use up the fuel. To avoid it from dying out half-burned and filling too much oil next time, do not leave the warmer in a cold place. Q.It smells of fuel while using. A1.Use zippo premium lighter fluid. Otherwise there are some fuels smells bad. A2.Use new burner. If the burner is heavily damaged, it smells more of fuel. A3.Since the warmer runs on fuel, some smell of fuel is inevitable. Apply it to the lower back or the back. Q.Dropped the warmer into the water. A.Remove the cotton from the tank and dry it by indirect heat (ex.a hair dryer) then change the burner to the new one. Q.Carrying the warmer in the airplane. A. Since the warmer runs of fuel, you may not be able to carry or put it in the checked baggage. Consult the airline you are planning to use in advance for further information.